Vannes is a medieval town on the Golfe du Morbihan, with a lovely port and old town. 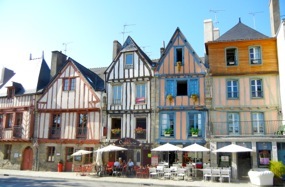 Vannes today is a bustling city of 50,000 people, but the heart of it is the old town center and the port de plaisance, or marina. The narrow port is lined with boats, and the Place Gambetta, at the head of the port, has many restaurants. Place Gambetta is also where you can enter the old city, through the Porte St-Vincent. You can walk on the ramparts and get varying views of the town and the walls, as well as the lovely Jardins des Ramparts (Ramparts Gardens). You'll also see some interesting old wash houses. Wandering through the old town you'll see beautiful old homes, well preserved. The Place Henri IV has a number of 16th century buildings. The nearby Cohue, or marketplace, is also of interest, and is home to La Cohue Musée des Beaux-Arts, or Fine Arts Museum. The Cathédrale St-Pierre, with its tomb of St-Vincent Ferrier, is just across from the museum. Perhaps most unusual in the old town is the 16th century building that has two carved and painted wooden busts. 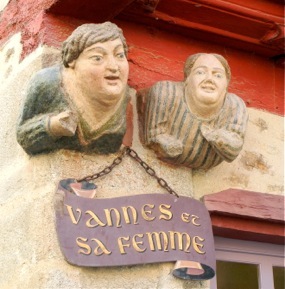 They are assumed to have been part of a sign for a shop, and they've been nicknamed "Vannes et Sa Femme." 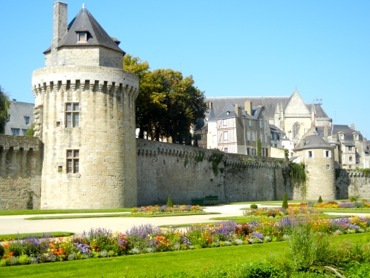 Vannes is just 30 kilometers (19 miles) northeast of Carnac, and 64 kilometers (40 miles) south of Josselin. It's about equidistant from Rennes (115 kilometers/71 miles to the north east, and Quimper (117 kilometers/74 miles to the north west). It's a pleasant place to walk around, and there are many options for an outdoor lunch by the port. Above, Half-timbered houses near the port. Below, Vannes et Sa Femme (16th century).